Don’t miss what ediscovery experts say about their data processing and review plans for 2017. 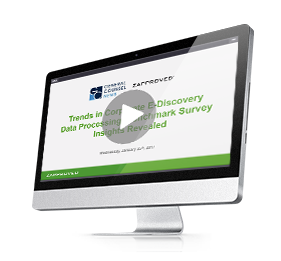 In this exclusive webinar, our expert panel from Sanofi U.S. and Scripps Health explores trends in ediscovery data processing and discusses the survey results captured in the 2017 Ediscovery Data Processing Benchmark Report. Be sure to catch this on-demand webinar now, while it’s available. Corporate legal departments are increasingly bringing more elements of ediscovery in-house to build efficiency and predictability. As enterprise-ready cloud technology expands, many legal teams are also embracing these innovations to modernize their ediscovery practices. These forward-thinking corporate law departments are leading the transformation of in-house legal operations into an ROI-focused, outcomes-driven business function. The data processing, early case assessment and review phases of ediscovery are fertile territory for in-house legal to take greater control. By leveraging new technologies to manage these ediscovery business processes, teams can reduce costs, save time, build competitive advantages and better prepare for the future. The webinar, based on the Corporate Ediscovery Data Processing Benchmark Report, offers essential clues for fine-tuning your in-house strategy.